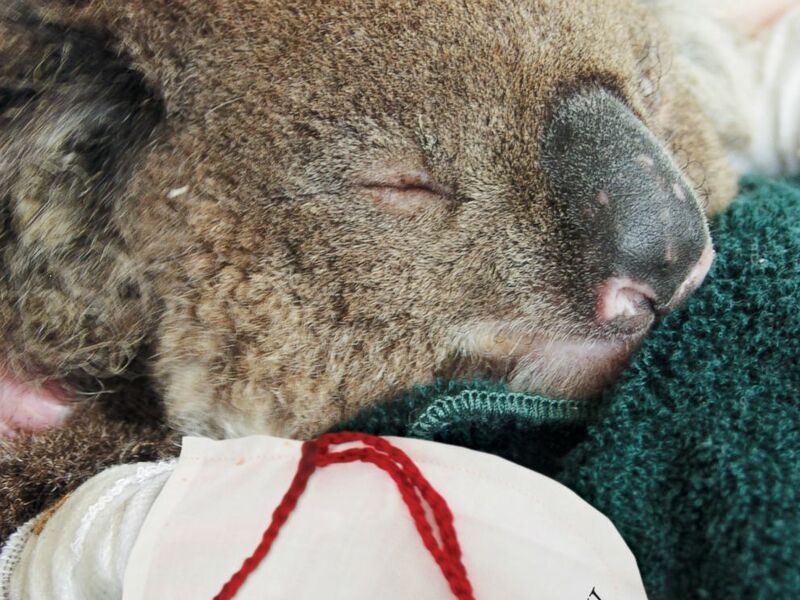 Koalas injured in a bushfire in Australia are healing with the help of paw protectors and some tender loving care. A male koala named Jeremy was brought to the Australian Marine Wildlife Research and Rescue Organization (AMWRRO) after fires swept the Sampson Flat locality in South Australia, where it's the summer season. The International Fund for Animal Welfare (IFAW) is asking volunteers to make paw protectors that are used over bandages. A pattern for the mittens is found on its website, using 100 percent cotton. A koala received burn pads for its paws after getting caught in a brush fire in the Australian Outback. Koalas with burns are often injured on their paws, which is caused by contact with burning trees or from fleeing across fire grounds, the IFAW said on its website. Jeremy the koala is recovering and will hopefully be released in the "weeks to come," AMWRRO said on Facebook. "Jeremy has been assessed and all four paws treated for second-degree partial thickness burns," AMWRRO states on its Facebook page. "He is doing very well and is in great spirits." The AMWRRO said after several koalas were brought to its location, "more are expected to follow," according to the group's Facebook page. "Slow-moving koalas have been the sad victims of bushfires in South Australia, Victoria and New South Wales during fierce wildfires over the past week," the IFAW said on its website on Wednesday. A young female was rescued on Wednesday afternoon and was transferred to AMWRRO but was later put to sleep due to her condition, the Facebook page states. "This young female was also a mother who had lost her pouch young whilst trying to beat the flames; the joey unable to be found on site," the Facebook page states.